Hemp seed oil, also known as hemp oil is a great way to improve your health all round. The great news is, it’s grown here in Australia and not only is it beneficial for our health but it is also great for our Australian economy, creating more jobs and Australian businesses. 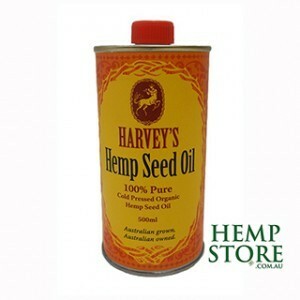 We not only stock our brand ‘Harvey Hemp Seed Oil’, but also products from ‘Green Hemp’, ‘Hemp Hemp Hooray’, ‘The Good Oil’ and ‘Mama Said’ All australian owned and run. So what are the benefits of using this oil? Hemp seed oil contains all of the essential oils that our bodies require but that we don’t produce on our own. That is our omega 3,6 & 9, and in a perfect ratio to what our bodies require each day. We have all heard about taking fish oil to up our omega 3 intake, however there are 22 times more omega 3 in Hemp seed oil than there is in Fish Oil, meaning that we do not need to kill the fish, nor have to worry about any toxins that might be in the fish oil that we have no control over. Having a balance of these oils means that your body is in a much more balanced state. Too much omega 6 can cancel out your omega 3 so it is important to have this perfect ratio for your body. Hemp seed oil is also amazing for the skin. Well known for treating skin irritations and conditions such as Eczema, Psoriasis, insert bites, burns and rashes. Also great for ongoing skin and hair nourishment. Hemp Seed Oil skin & hair care products, strengthen and repair damaged areas as well as deeply moisturise dry and effected areas of the skin including burns and scars. Also increasing skin elasticity as well as an all round lovely glow back to your skin. There are other amazing benefits that come with this oil, including lowering inflammation, lowering cholesterol, boosting immunity, heart health and the list goes on. So why not try this ethical, accessible, natural plant based Body Product, that improves health and eliminates so many other toxic products that we apply topically and ingest unnecessarily every day. Check out our range today and enjoy the benefits as they unfold.